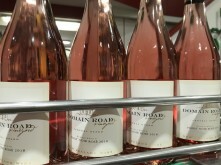 Hot off the line - Our 2018 Pinot Rose bottled today! We're very thrilled to have this back in stock. Our 2017 vintage didn't even make it into our cellar door due to being sold prior to release!